Meet Us on the Web! Thank you! 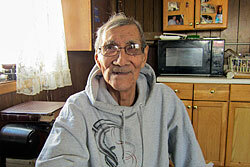 Your prayers and support are making it possible for KNOM to serve thousands of families in Western Alaska. 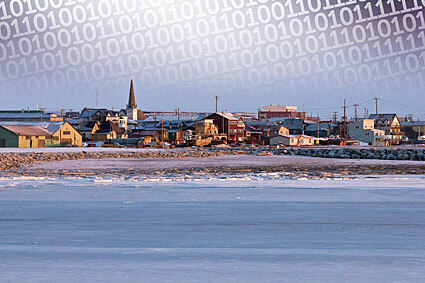 This spring, that service is taking many forms; as the snow thaws, we're keeping busy in Nome. Our volunteers continue to bring new energy to our mission. In recent weeks, second-year volunteers Matthew Smith and Matty Guiffré have both spent time in communities where KNOM listenership is strong, Savoonga (suh-VOON-guh) and Little Diomede (DYE-uh-meed). These trips are crucial to our mission, since they allow us to connect with our listeners, to hear and record their stories, and to report on newsworthy events. 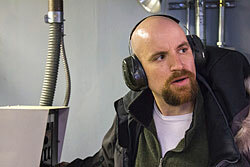 Below, you'll find more about Matty's experience in Diomede – one of the most unique communities in the world. 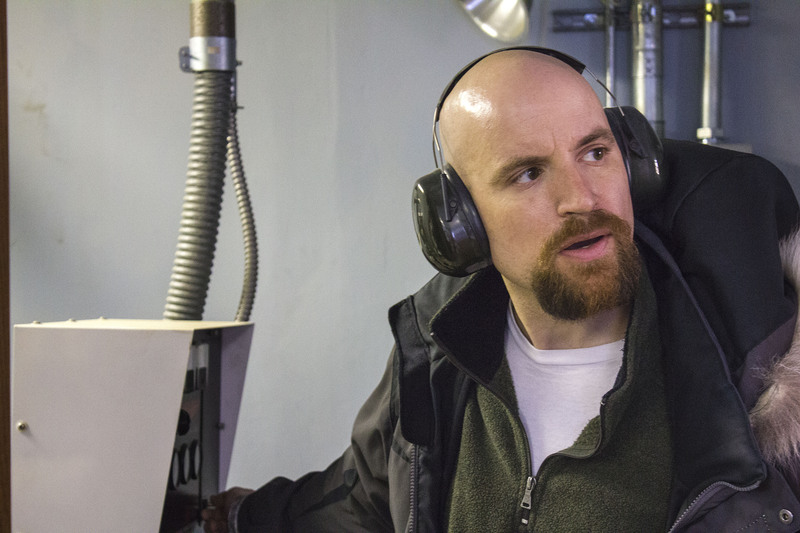 Back in Nome, we remain committed to ensuring the future of our mission: in large part, through the maintenance and renovation of our broadcast studios. As you'll read below, we continue to refine our blueprints for the Tom and Florence Busch Digital Studios, the construction of which will save us considerable amounts in our energy costs and operating funds. In the meantime, we're keeping our current facilities working smoothly, thanks to the expertise and guidance of handymen and engineers. As always, we continue to pray for you and for all you hold dear. Every day, your generosity is bringing inspiration, education, companionship, and so much more into the rural stretches of Western Alaska. Thank you for making that possible. Have you stopped by our website recently (aside from this page)? There's lots to explore here at knom.org. 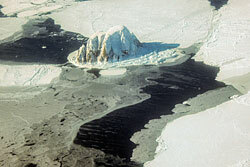 In addition to electronic issues of this newsletter – stretching back to the late 1990s – we offer audio from almost all of our news programs; detailed information on our daily schedules; a fascinating look at the history of our radio mission; hundreds of original photos; information on our volunteer program; options for online donations; and much more. Our website is a valuable resource for our listeners as well. It gives our often-isolated audience a chance to send messages or announcements for broadcast, to submit music requests, and to participate in our popular Sounding Board call-in shows, which explore topics of regional significance. From our website, many of our listeners also connect through our social media channels: on Facebook, on Twitter, on our volunteer blog, and on the photo-sharing site Flickr. 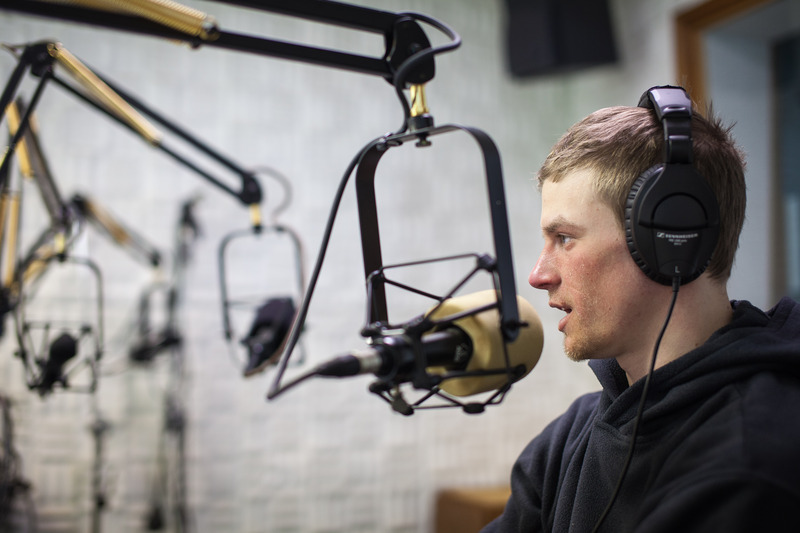 These outlets, together with our website, give our listeners and our supporters a daily look into the happenings at KNOM and throughout Western Alaska. 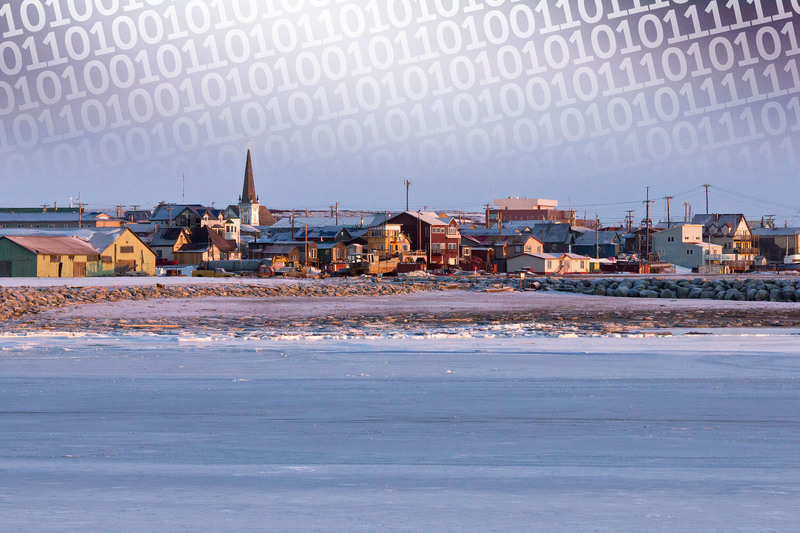 Every day, our mission spreads beyond our air signal: not just in Western Alaska, but also on the web. We encourage you to (continue to) visit us today at knom.org. If you begin each day believing great things can happen, you just might be the one to do them. 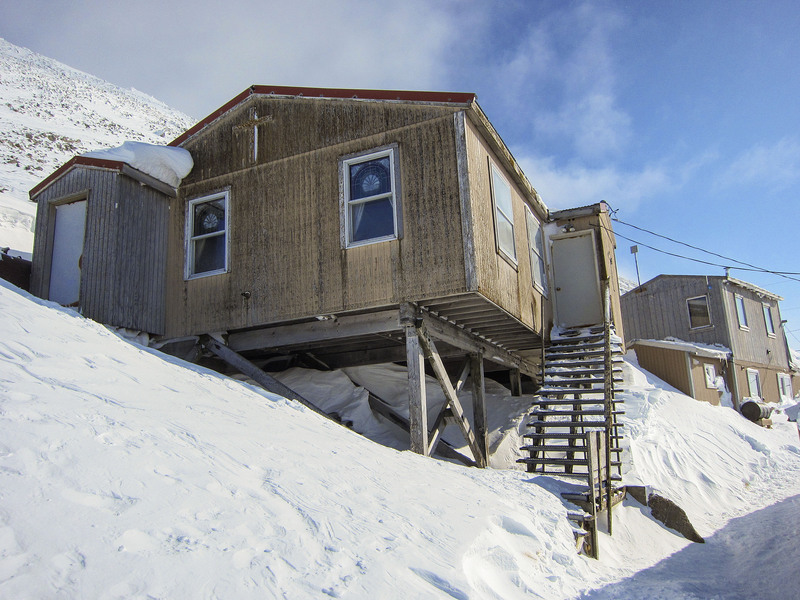 I was recently privileged to take a trip to the remote village of Little Diomede (DYE-uh-meed), Alaska, located on a small island less than a half mile from the International Date Line near Russia. I went there to collect an interview for KNOM's newest show Caught Doing Something Good, which I created in February to focus on the positive things going on with youth in Western Alaska. 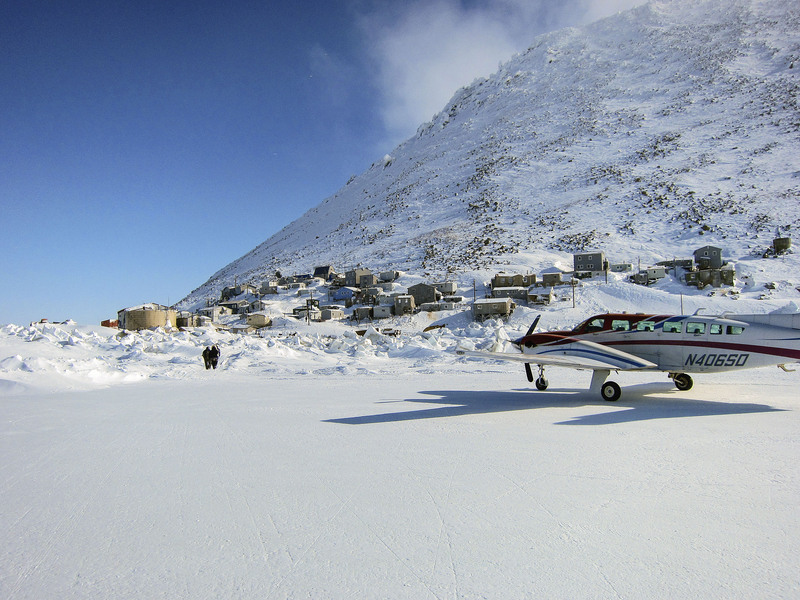 About 135 people live in Little Diomede, which can only be accessed via bush plane during the winter months, when the sea ice is frozen and a runway is carved out on the ice. 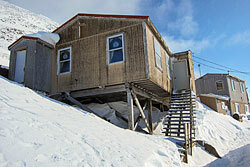 The residents of Diomede were very welcoming, and I quickly became accustomed to what it was like to live on a cliff. The locals moved around town a lot faster than I did, negotiating the slippery paths between buildings on the steep terrain. Even beyond the interviews for which I had come – five students who had done exceptional things in their community – an extra story presented itself: a local hunter shot a polar bear while I was in town, and I witnessed the process of carving up a kill. Per the traditional ways, almost all of the polar bear will be used: the meat will be used for food and the fur hide for artwork. I appreciate all who make it possible for me to travel to collect these inspiring stories. 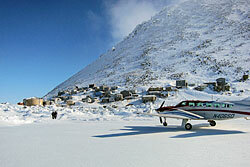 Thanks to a sponsorship with a regional air carrier, Matty's transportation to Diomede was free. 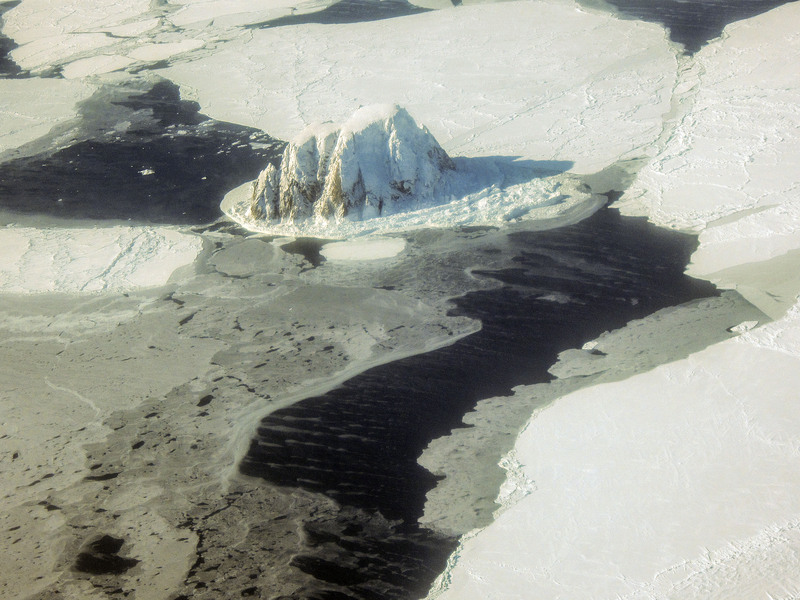 Photos, top to bottom: Little Diomede island, seen from the air amid the frozen sea; the village and its ice runway; Diomede's St. Jude Catholic Church; respected Diomede elder Patrick Omiak, Sr.
Late this month, KNOM will provide live coverage of the annual Memorial Day parade in Nome. 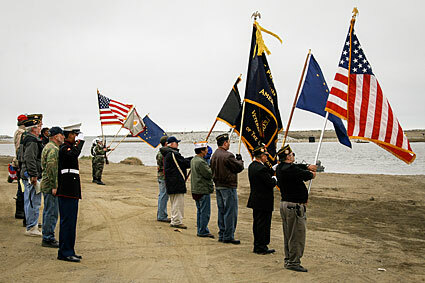 The parade (as pictured) will lead veterans and residents through our streets, stopping in Nome's cemetery to remember those who made the ultimate sacrifice. At KNOM, we're honored to cover this special event, as we have for years. 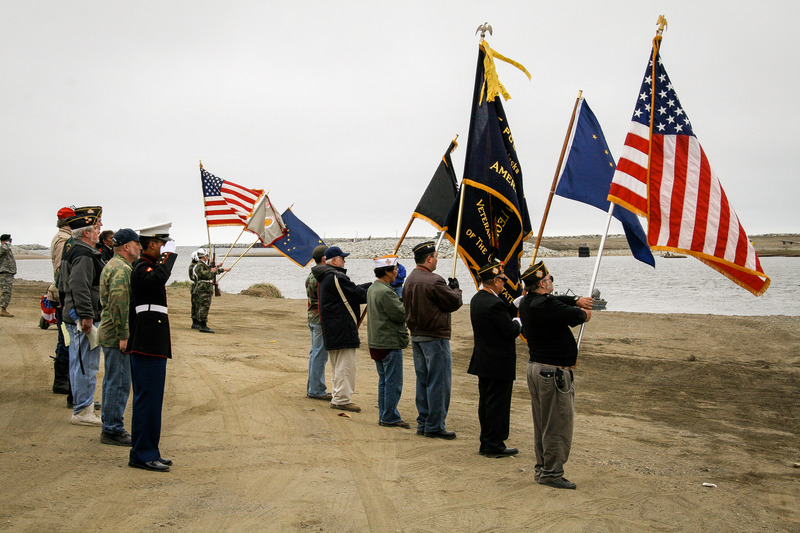 Across Western Alaska, thanks to you, thousands of listeners will be able to join us in honoring the sacrifices of our veterans. 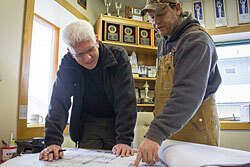 As you may have read in the March Static, KNOM is in a process of transition. We've legally separated from the Diocese of Fairbanks and are now an independent organization with a new name, KNOM Radio Mission, and a new board of directors. Many have asked: are you still a nonprofit organization? Are you still Catholic? The answer to both questions is an emphatic yes. The changes we've made to our mission's ownership are solely to preserve and maintain the mission to which KNOM has been dedicated since 1971. Our listeners and supporters will see no change to KNOM's mission or programming. All of our staff are retaining their roles: including our spiritual advisor, Father Armand Nigro. We remain a Catholic radio station and a registered 501(c)(3) charity; just as before, donations to KNOM are tax-deductible, if itemized. As always, we hold sacred the relationship with our supporters, and we never share any of your personal information or contact details with anyone else. Through your generosity, KNOM's independent status will help ensure our mission's continued presence. Although our letterhead has changed, we are committed to remaining "Yours for Western Alaska" for decades to come. Thank you for all you do. Serenity is not freedom from the storm, but peace within the storm. In April, KNOM was abuzz with activity, as we not only performed maintenance on our current facilities but also prepared for the future of our studio buildings. 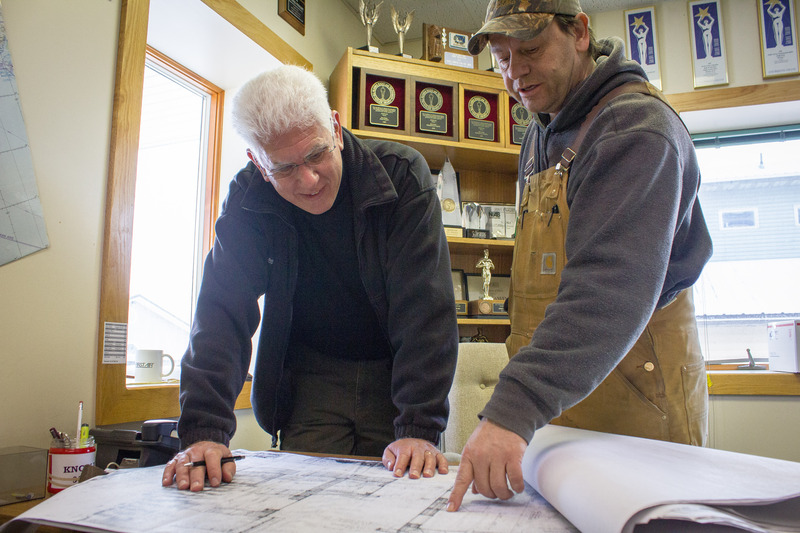 We benefited, once again, from the work of longtime architect Frank Schmidt – brother of general manager Ric Schmidt – and the expertise of contractor Randy Pomeranz, who helped to construct KNOM's current studio building in the 1990s. Frank and Randy (pictured at top) reviewed the latest blueprints for the Tom and Florence Busch Digital Studios, the renovation project that will expand KNOM's studio space and convert our aging, analog broadcast equipment to digital. As we've written in prior editions of the Static, this project will mean con siderable cost savings over the long run, and thanks to Frank and Randy – and your support! – we're well on our way. Just days later, we were grateful for the care of Nome handyman Rolland Trowbridge, who followed up on previous maintenance work at our studio building's backup power generator. Rolland and Ric conducted a full test of the generator, briefly switching from municipal power to make sure that the generator activated as needed. Rolland, as pictured at bottom, kept a close eye on the many dials on our power generator apparatus, and thankfully, all went as planned. Thank you, Rolland, Randy, and Frank! Charity comes from practice. The more you practice, the better you get! 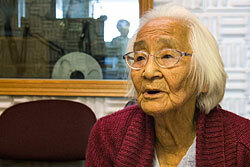 Every week, KNOM's studios see a broad cross-section of Western Alaskans. 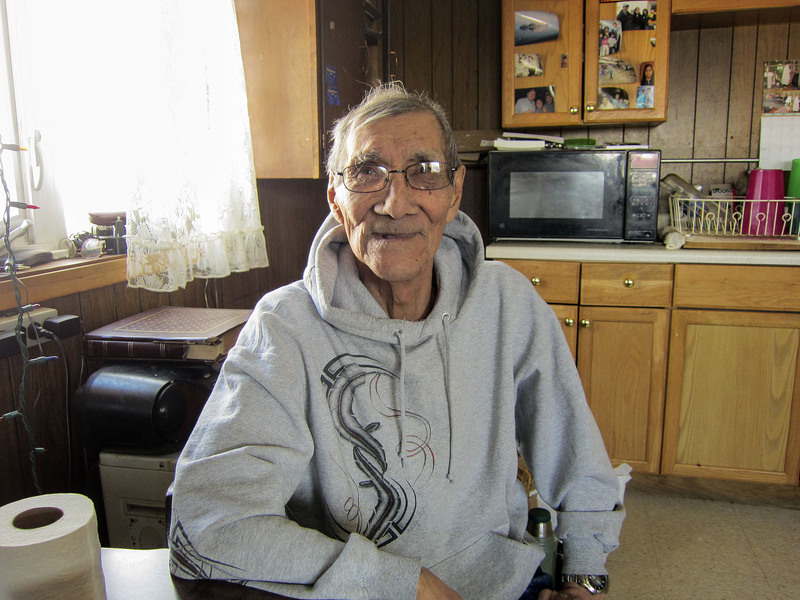 Thanks to your support, we regularly interview people who are making a difference in our region, whether as community leaders, revered elders, educators, or public figures. The photos at left show just a few of our recent guests. 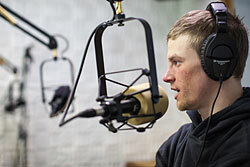 At top is 2012 Iditarod champion Dallas Seavey, who spent time in KNOM's Studio C a few days after crossing the finish line. 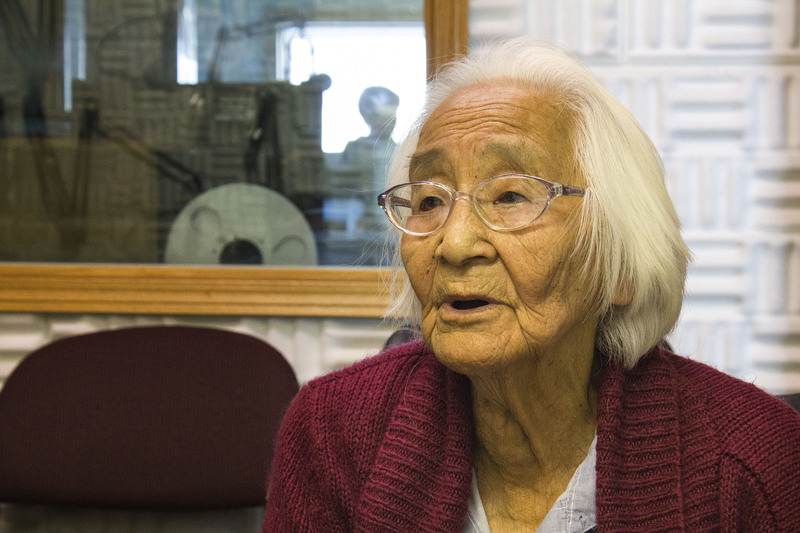 At bottom is Dina Sagoonick (sah-GOO-nick) of Shaktoolik (SHACK-too-lick), Alaska, whose life story was featured in the April 2012 episode of our popular show Elder Voices. We worry about what is coming tomorrow. Don't be afraid: God is already there! We conclude with wonderful news. 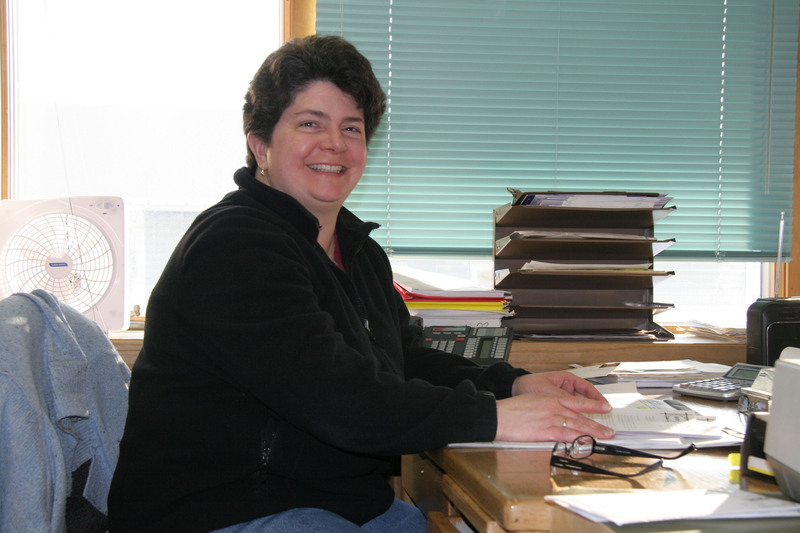 KNOM volunteer alumna and former part-time staff member Betsy Brennan (pictured above) has returned to our mission: this time, as a full-time staff member in a new position, Development Data Manager. 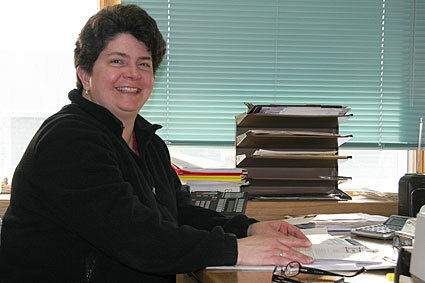 She'll be working in our business department – and, quite possibly, interacting with you when you call or write!